Naruto Manga Chapter 484 Team Seven is already out. Sakura take Karin to the save place and start healing her while crying in front of her. At the same time, Kakashi and Sasuke starting their fight, Naruto still confuse about what he must do to bring back Sasuke. 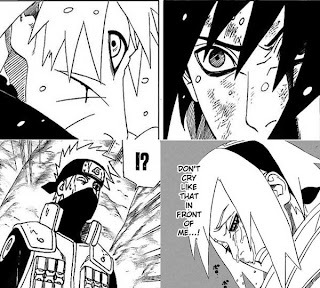 A little flashback in Naruto memories, he try to get conclusion from Itachi, Gaara and Raikage's words about Sasuke. Naruto will know the answer when he see Sasuke. Back again into the battle between Sasuke and Kakashi, Sasuke attack Kakashi with Susanoo, fortunately for Kakashi to be able to activate the mangekyou sharingan too. When Sasuke anger become bigger, suddenly his Susanoo change become more frightening. But its also has effect to his vision, Sakura take this chance to stab Sasuke from behind. But she can't do that, even Sasuke make counterattack and almost kill her if Naruto didn't came at the right time. Finally TEAM SEVEN reunited. What is Naruto answer?